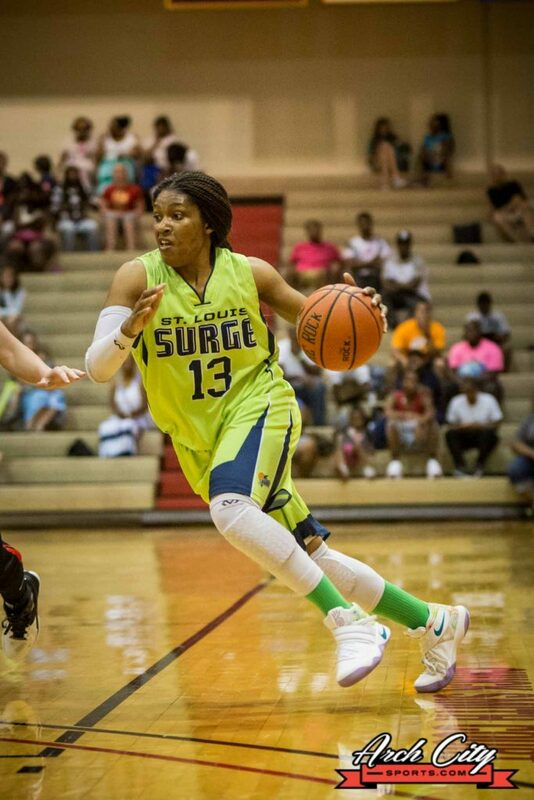 Winners of four straight, the St. Louis Surge women’s professional basketball franchise looks to solidify its traction in the Women’s Blue Chip Basketball League (WBCBL) Midwest Division this weekend at home. 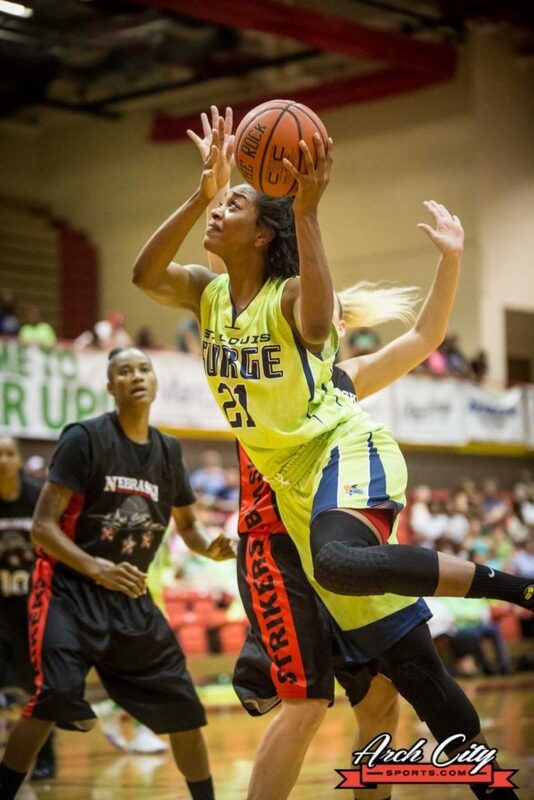 St. Louis (5-1) hosts the Iowa Force (2-3) Saturday at 7:05 pm at UMSL’s Mark Twain Building (1 University Boulevard, St. Louis, MO). Tickets for the “Power Up Pink, Balling For a Cure” event are $8 for adults while students are $5. Children five and under are free and youths wearing their local hoops jerseys also receive complimentary admission. 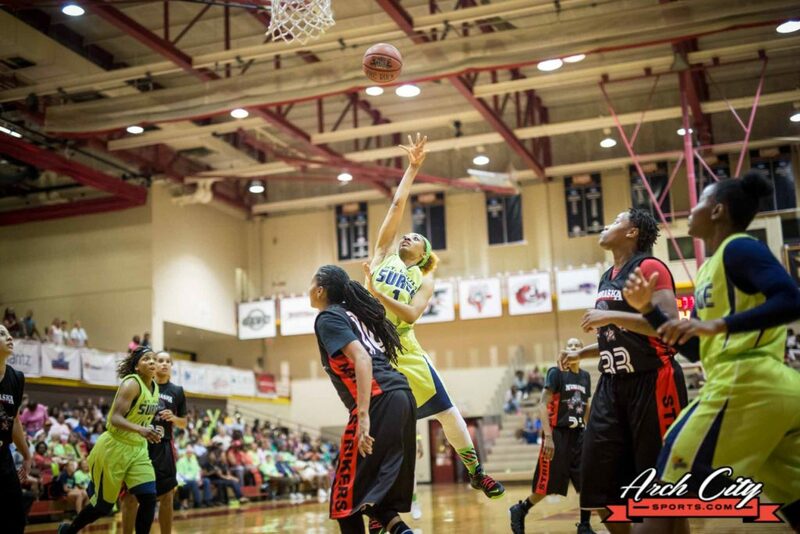 The Surge topped the Nebraska Strikers, 103-88, this past Saturday at the team’s home opener for its fourth consecutive victory and dealt payback to the visitors that topped the locals earlier this season. The 25-point duke pushed St. Louis to a first-place tie in the six-team Midwest Division standings alongside Flyers Elite, also 5-1. Against Nebraska, the Surge trailed by a solo point at the conclusion of the first quarter but produced a 28-16 second frame for a double-digit halftime edge. 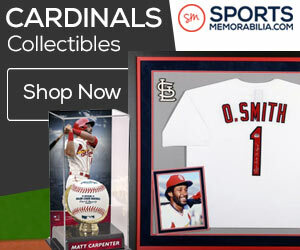 St. Louis knows that defense will be imperative again this weekend and will use the upcoming days to prepare for that aspect. “We need to focus on defense by locking (Iowa) up and not letting them get easy shots,” assessed Surge forward Shanity James, who finished Saturday’s game with 16 points. Guard Rebecca Harris topped St. Louis scoring with 27 points against Nebraska while newcomer Michala Johnson added 15. As a whole, first-season Surge players contributed over 40 percent of the team’s total points Saturday against the Strikers and have fit well into the program overall. St. Louis’ multi-faceted attack also contains veterans Leah Cotton, Cassie Rochel and Raven Berry while 2016 additions Denisha Womack, Brittany Wilson,Tori Waldner and Jenny Rocha also provide pivotal minutes of offensive and defensive play. Saturday’s opponent, Iowa, is currently sits in third place in the WBCBL Midwest Division standings following a 104-91 road loss to the aforementioned Flyers Elite this past Saturday. The Force’s offense is propelled by guard Charmaine Bell, a three-point weapon that netted 22 points in the pair’s meeting earlier this season, a 94-72 duke claimed by St. Louis on May 11. Guards Rebecca Kramer, Alison Nagel and Sharnae Lamar also enter the contest with double-digit averages. The Iowans aim to play spoiler and snap the Surge’s current 13-game home winning streak Saturday. Close to 1,900 spectators at UMSL saw St. Louis claim its fourth straight win this past weekend and another large crowd is anticipated Saturday to push the team’s home winning streak to 14 games. 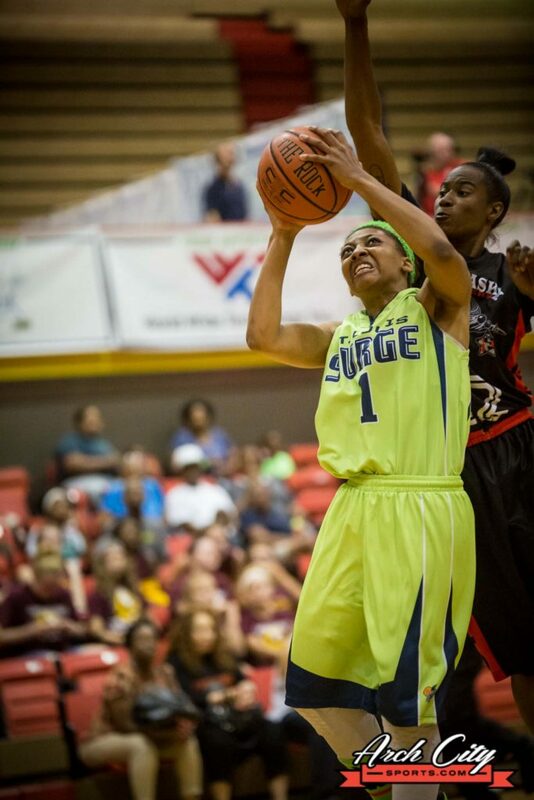 For more information on the Surge and for advance tickets, go to stlsurgebasketball.com.